I'm often keeping my eyes peeled on Terra Nova Nursery's new plant introductions. They paint with a bold palette, bringing eye-candy goodness to life, animating lovely and envious new things. Now, my feet are firmly rooted on our soggy terra firma, but my head is sometimes off in the clouds. It's not always the "novelty" plant, the hoop-jumping lion of the green world, that will seduce and literally bust my pocketbook (the zipper of which has long since been looted by trespass), but it's often a good old-fashioned charmer, an ornamental staple that I end up gently hauling home, for I have a rational side as well. I have kept a nursery tag for 1 of every plant species I own or once owned that was more of a novelty for me, if only when I bought it. Every gardener starts at the beginning, right? I look through the stack each new year, and honestly remember many lost plants - some went back to the earth by way of the compost bin, some went home with friends, some are still thriving at a previous address or two. And by this process, I'm able to better resist the newbies of each successive year. 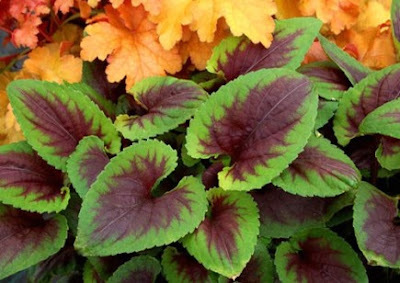 Well, last fall after a brief introduction, I brought home another circus lion, a younger version of an old favorite, a variegated Viola called "Heartthrob". It's just waking up from winter, and we're fighting the slugs together. So I have yet to see how it will perform in our little space, but it's already showing signs of longevity, having survived two transplants, our cold winter, and a spring onslaught of slug armies. This is what it looked like when I brought it home!